Help: Holidayhouses.co.nz - NZ Holiday Homes and Baches accommodation for rent. Search on the site to find properties you’re interested in, and contact owners directly with any questions about their property. Use the search box located on the left of every page, or try an Advanced Search. Click one of the regions on the homepage map and continue until you find properties you’re interested in. Most of your questions should be answered on the property listing pages. Click the 'Save to Shortlist' button on any property listing page to bookmark properties you’re interested in. Then visit the Shortlist page to view the properties you’ve saved and make enquiries. To make a booking, contact the owner or manager directly from the information on the property listing - either e-mail or phone them. Please mention Holiday Houses when you contact them. During peak times, it may take longer for the owner or manager to respond to your message. Please wait at least three business days to hear back from them. We are unable to book properties on your behalf. Please contact the owner or manager directly. Never send money overseas. The vast majority of our house owners are based in New Zealand, so if you’re asked to send money to an offshore bank account you should think twice and contact us. If you see something dicey, let us know by getting in touch through the contact us page. Pay Per House is our subscription model. You pay us a listing fee to show your house on the site. Your Pay Per House listings receive enquiries from renters, and you do not pay any commission on bookings that you get from enquiries through the site. Please note you are not able to offer online credit card payments to renters if you choose this model. Our standard Pay Per House pricing depends on the listing tier you use. Silver listings received 171% of Classic leads per house. Gold listings received 295% of Classic leads per house. We offer generous discounts to owners with multiple houses. Our current discount structure is as follows. Please contact us if you have more than 50 houses to discuss our pricing options and what we can offer you to maximise your exposure on the site. When we invoice you the discount we apply is determined by looking at the number of valid listings you have on your account with us. To count as a valid listing the house must be on a 12 month term and have a current paid invoice. When your houses are renewed they will all receive the same discount. When you add a new house you might enter a new discount range in which case we’ll apply that discount on the new house, and when we renew your houses they will all receive the same discount. We also offer short term listing options. These listings do not qualify for Multiple House Discounts. Short term listings can be attractive if only want to list your house out for a limited amount of time (over summer for instance). Don’t forget that renters are looking for holiday accommodation all year round, and many baches receive bookings for the busy summer period during winter. To maximise your chance of fully booking out your bach you might want to consider having the house visible on the site all year, but blocking out unavailable dates in the calendar. The Pay Per Booking model is ideal for this situation, as you only pay for bookings you receive, not how long you spend on the site. Pay Per Booking is our commission model. A commission is paid on each successful booking you receive through the site. Payment is taken online using our secure credit card processing facility. There is no additional fee for credit card processing. You can choose to accept bookings instantly or 'on request'. With 'on request' bookings we send you a booking request from the renter which you can accept or decline. We charge the renter when you accept the booking. NOTE: Pay Per Booking listings do not qualify for multiple house discounts as described in the Pay Per House section above. When you have a Pay Per Booking house we will send you booking requests from interested renters. You have the option to accept or decline these bookings and we will charge you commission on any accepted bookings. You can accept or decline bookings on our site by clicking the button on the email we send you, or by logging into your Holiday Houses account and clicking "View all enquiries" for the appropriate house. Please respond to booking requests as soon as you can so the renter can find alternative arrangements if you can’t accommodate them. We will charge you commission on all accepted bookings. We do not charge commission on any bookings you decline or cancel. We will charge the renter’s credit card when you accept the booking. We will do this immediately if you have selected instant confirmation, or we will wait until you respond to our booking request email if you have chosen 'on request'. How do I contact the renter if I want more information? We know many Holiday Houses owners want to talk to their guests before approving their booking, so we include the renter's details in the request we send you. That means you can easily contact the renter directly before you accept the booking if you need extra information from them. Will I be charged for declining a booking? No, we only charge for bookings that go ahead. That means if you accept a booking but have to cancel it at a later date you won’t get charged commission. That's not a problem. We know that bookings sometimes fall through, so you can easily cancel an accepted booking through your holiday houses account. View your bookings by clicking "View all enquiries" for the appropriate house. You need to create an account to list a property. Fill in as many details about your property as you can, and add plenty of photos – it will save people contacting you with unnecessary questions. Just login to edit your listing at any time. We've made some improvements to the booking calendar. You can also export your Holiday Houses calendar so you can keep your other calendars that support the iCal format synchronised. The export includes dates booked through Holiday Houses, and excludes those imported from other calendars. 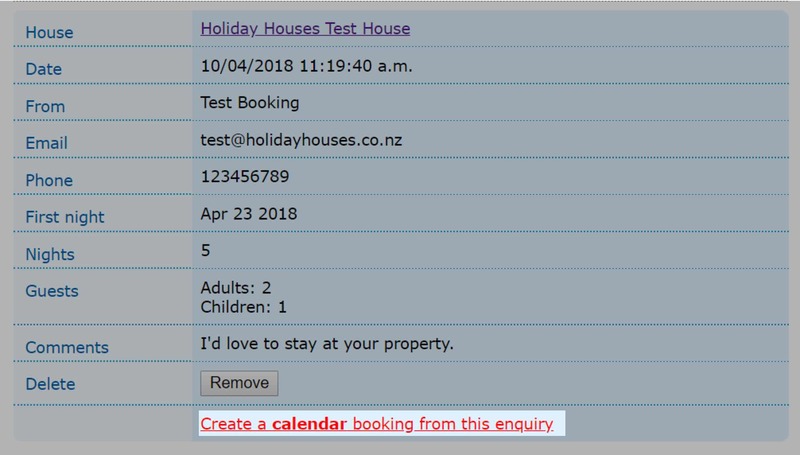 Please note that every listing on your Holiday Houses account has it's own calendar, which will need to be exported individually. Step 3: Copy the URL. You can the pase this into your other calendar applications. Once you confirm a booking in the system, the renter will automatically receive an email from us encouraging them to leave a review after they have checked out. Renters can rate your property from one to five stars and leave feedback about their experience. Step 1: Log into your Holiday Houses "My Account" page. Step 3: Click on "Create a calendar booking from this enquiry"
Once the booking has been added to your calendar, the renter will automatically receive an email from us to leave a review after they have checked out. If you don’t follow these steps and add the enquiry to your calendar, we won’t know that the enquiry converted to a booking, and therefore we will not prompt the renter to leave a review. This tells us that your guests have had an incredible stay and the feedback will be visible on your listing immediately. We’ll review this first to make sure it’s in line with our terms and conditions. If approved by our customer service team, it will be made visible on your listing. Holiday Houses is promoted online and offline and receives over 200,000 visitors per month (statistic from Google Analytics). Your listing will appear in search results when people search for properties in your area, from the main region to the suburb, for certain keywords (e.g. swimming pool, beach) and by price and availability. The Super Feature rotator shows our gold houses in random order. 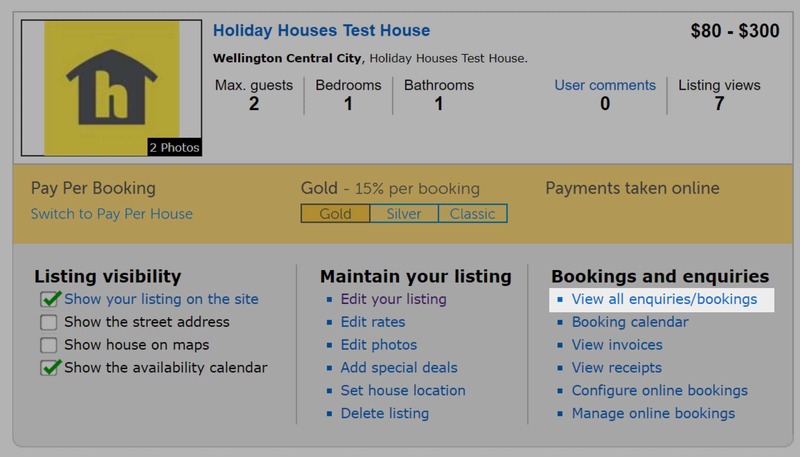 Holiday Houses is the largest holiday home advertising site in NZ, with over 9,000 homes listed. Your property details will be available 24 hours a day to holiday makers around the world. You can upload up to 30 photos to help showcase your property. You will receive a weekly report for your listing, including the number of times the listing has been viewed and a summary of enquiries received. You can login and change your listing anytime at no charge. You can use our booking calendar and map system to display your property on our availability and map search pages. We will continue to develop and expand Holiday Houses. We can be contacted here if you would like further information. All pre-paid listings are non-refundable. This includes (but is not limited to) where you choose to remove your house from the site before your listing period is up. Ensure you have functioning smoke alarms. The NZ Fire Service suggest installing long-life photoelectric smoke alarms in every bedroom, living area and hallway. The battery for these smoke alarms doesn't have to be replaced for up to 10 years but check them regularly to ensure they're working 100%. Have a fire extinguisher at your holiday house so you and your guests will be better prepared to put out small fires before they become big ones. Create an escape plan, and have this information available in a welcome pack for guests when they arrive at your property. Also, provide information about where they can find a first aid kit, fire extinguisher, emergency phone numbers, and where they can find the nearest hospital. Contact your local authority to see if there are any health and safety regulations or by-laws that you need to comply with. Identify potential hazards and ensure you meet regulations to minimise any danger associated with them. Swimming pools, decks, chemicals/poisons are just some of the potential hazards to keep in mind when safeguarding your home. Ensure your appliances and heating devices (eg, oven, heaters etc) are in working order and checked periodically to make sure they're safe. We recommend that you check with your insurance provider to ensure you have adequate coverage in the unlikely event that something goes wrong while a guest is occupying your property. It may be worth taking out public liability insurance on top of your home and contents insurance to ensure your home is covered for rental activities – talk to an insurance expert for advice. Any money you get from renting out your bach, house, a room, a caravan or a sleep-out is taxable.